Happy passengers stroll away from a B.O.A.C. Boeing Stratocruiser at London Airport. Happy passengers stroll away from a B.O.A.C. 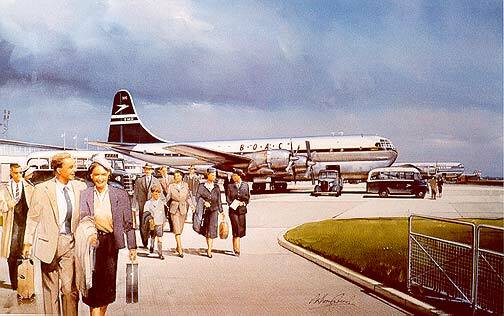 Boeing Stratocruiser at London Airport. An atmospheric look at airline life of the stylish fifties sees Stratocruisers and Constellations adorn the tarmac of an ever expanding Heathrow. A limited edition print of 500, by the artist Anthony Cowland G.Av.A. captures beautifully this nostalgic scene.